888poker LIVE brings over $1,000,000 in guarantees to the beautiful beaches of Barcelona. They may run with the bulls in Pamplona, but you can swim with the sharks this summer in Barcelona. The 888poker LIVE tour is headed to Barcelona and bringing with them a two-week festival packed with affordable tournament action and over $1,000,000 in total guarantees. There are 15 tournaments spread out over the course of the festival. Whether you want to play for big money at a reasonable buy-in or just grab a seat in a turbo – 888poker LIVE Barcelona has something for every poker fan. The whole series is anchored by the Main Event, a €1,100 buy-in that carries a €500,000 guarantee. Three starting flights, beginning on May 31, allow players to stumble in from the beach at their convenience. All players begin with a 30,000 starting stack and will play 12 45-minute levels on the various Day 1’s. Those who advance to Day 2 will see levels increase to a full hour and they’ll play until a final table is reached. That final table will be live-streamed with commentary by veteran poker voices David Tuchman and Nick Wealthall. Not only will the winner take home the first place prize and the coveted 888poker LIVE trophy, but an additional package to attend the 888poker LIVE festival in London later in the year. Before you make it to the Main Event though, the schedule provides a fantastic reason for showing up early. On May 24 begins the 888poker LIVE Barcelona Opening Event – a €220 buy-in with a €100,000 guarantee. This tournament gives players plenty of chances at making the big money. It has a moderate buy-in, four starting flights, 30,000 in chips and 30 minutes levels (levels increase to 40 minutes on the final day). Players who punt their stacks have two opportunities to re-enter and there will be multiple €50 turbo satellites helping pack the field with qualifiers. On May 30 there will be a €2,200 High Roller event, where the winner, in addition to the money and the glory, will also receive a package to represent 888poker in their signature World Series of Poker event – Event #62 $888 Crazy Eights. On the same day as the High Roller, the tour is also holding a €111 charity tournament in benefit of One Drop, the organization founded by Guy Laliberte that focuses on clean water initiatives. There is also a €220 Ladies Event where the winner of the event will be given an additional package to be entered in the Ladies Event at the World Series of Poker. In addition to all of the action inside and the beautiful beaches outside, there will be plenty of stars on hand. 888poker has confirmed many of their ambassadors will be on hand to mix it up with attendees. World Series of Poker Main Event Champion Martin Jacobsen, Natalie Hof, Sofia Lövgren, Vivian Saliba and the winningest online poker player of all time, Chris ‘moorman1’ Moorman will be swimming in the Spanish seas – poker and otherwise. 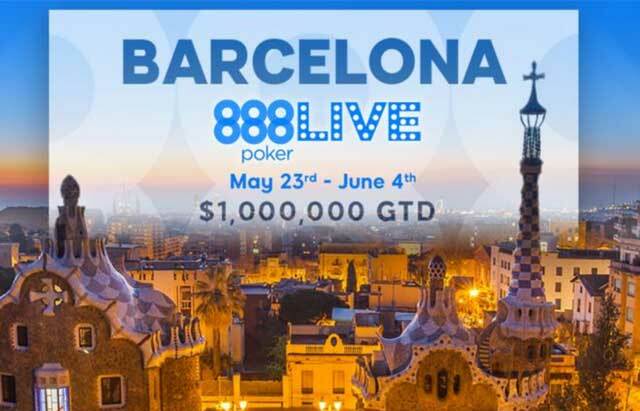 888poker LIVE Barcelona kicks off on May 24 with their Opening Event and wraps with the conclusion of their Main Event on June 6.